President Teodoro Obiang Nguema has pardoned six Armenian pilots who were sentenced to between 14 and 24 years in prison last November for allegedly taking part in a mercenary plot to overthrow him. According to a translated report on the BBC monitoring service, the Armenian TV AL+ website said the six Armenians, who repeatedly proclaimed their innocence, are to be brought home this week and are currently being treated in hospital. The group, who made up an aircrew, were among 15 foreign nationals arrested in March 2004 for allegedly taking part in a coup involving around 70 mercenaries, most of them South Africans. A German arrested with them died in detention about 10 days later. According to Amnesty International, the six Armenians and five South Africans who were finally convicted of plotting against the president have spent the last 15 months handcuffed and shackled 24 hours a day, including during the trial. News of their release came as Amnesty International released a 20-page report summing up its comments on the November trial against the alleged coup instigators in the capital Malabo. “This trial did not respect international laws and standards for fair trials, and breached national law,” the report said. Among its recommendations, the rights watchdog called for a quick and fair hearing of a defence appeal and an investigation into allegations of torture and human rights abuse. He was the sole defendant to have initially confessed to a role in the conspiracy. He later said that his admission of guilt had been obtained by torture. The prisoners have been held in Equatorial Guinea’s notorious Black Beach prison outside Malabo where Amnesty said last April they faced starvation. The head of state has been widely accused of corruption and human rights abuse during his 25-year rule of what used to be one of the world’s poorest nations. 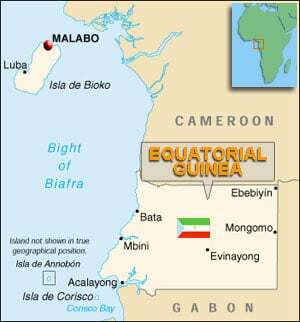 Equatorial Guinea now produces 350,000 barrels per day of oil and has become Africa’s third-biggest oil producer after Nigeria and Angola, but most of its 500,000 people still live in dire poverty. Although oil generates US $30,000 per year for every one of the Equatorial Guinea's 500,000 inhabitants - giving the country a gross domestic product per capita equivalent to that of Switzerland or Denmark - life expectancy remains low at 49 and less than half the population have access to clean drinking water, according the UN Human Development Index.